The Deus Ex series has always been one of the most respected names in gaming, with three solid core titles and one somewhat solid mobile game to its name. As you might expect, expectations for the fourth game are high, and today publisher Eidos dropped some new hints. 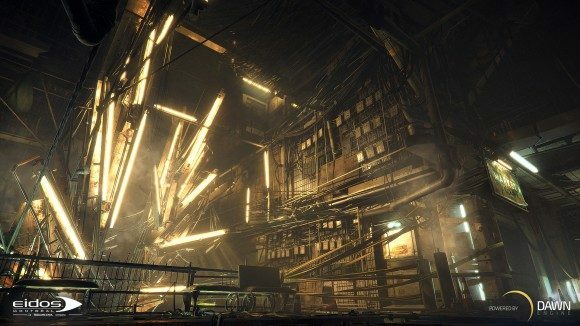 Little is known about the mysterious Deus Ex Universe, which was announced by Eidos in October last year. Suffice to say, it isn’t the title of one particular game, but is instead a blanket name that will be applied to all Deus Ex related games, mobile apps, books, graphic novels, and so on. Keep in mind – despite any hints you may pick up from this image, this screenshot was only taken in order to display the level of detail and artistic fidelity that is possible with the Dawn Engine. Deus Ex Universe is the name we are giving to the fictional world and the rich lore we are creating for it, which will of course include core games, as well as any other projects that will help bring the world of Deus Ex to life. We won’t go into too much detail for now, but what we envision is for our projects to have meaningful ties to one another, in order for them to strengthen and deepen your experience within this Universe. It will probably be a while before we finally see Deus Ex 4, but at least we’ll know that it will look good.